Today is International Dance Day; the day to celebrate dance as a manifestation of creativity and an art of imagination across the world. 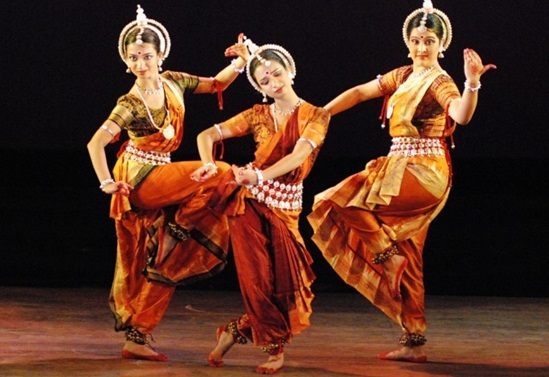 India too celebrates its classical dance culture, a priceless heritage of the ancient times. The Indian classical dance forms have made it to international heights from the four walls of temples and royal courts. A cultural legacy for generations, the classical dance heritage of India is worth a tribute today. Indian Eagle briefs the classical dances to celebrate International Dance Day. One of the most celebrated classical dance forms of India, Bharatanatyam is unique to the Dravidian culture of South India. Tamil Nadu and Karnataka, the South Indian states, have been basking in the glory of Bharatanatyam for generations. The origin of this classical dance is associated with the 2000-year old Devdasi tradition in the temples of South India. Bharatanatyam is mythically believed to be introduced by Lord Brahma and documented by Sage Bharata in the Natya Shastra, a Sanskrit text. Devdasis or temple dancers who were dedicated in service to the presiding deities used to perform Bharatanatyam in temples. Mridangam, Veena, Flute, Violin and Talam are some of the instruments used in this dance performance. If Bharatanatyam is the mainstay of South Indian culture, Kathak is intermingled with the culture of North India. The recitation of mythological tales in rhythm with music and dance in ancient India is believed to be the origin of Kathak. Therefore, this classical dance form is associated with the recital art of storytelling. In the bygone days, kathakars or bards or poets used to depict mythological stories from the scriptures through facial expressions and hand gestures in villages as well as temples. It became sophisticated and popular in the Mughal regime. Kathak has been patronized in Banaras, Lucknow and Jaipur. The story of Radha and Krishna is the predominant theme of Kathak. 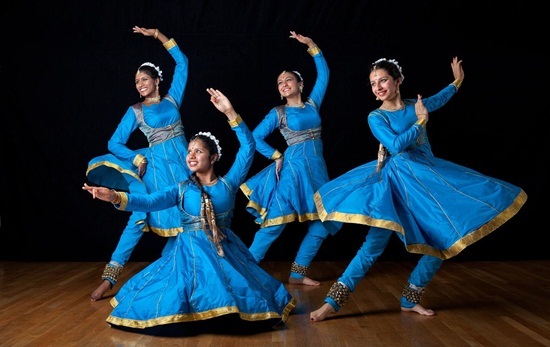 Such instruments as Tabla, Pakwaj, Harmonium, Sarengi and Talam are used in Kathak performances. Kerala has its own share of the Indian cultural heritage and that is for Kathakali, a classical dance form. Heavy makeup and colorful costume are the most amazing facets of Kathakali. The painted face and colorful appearance of Kathakali dancers are identified with the culture of Kerala. A most sophisticated form of imagination, Kathakali dance is a highly creative medium to depict the stories of the Hindu epics and mythologies. As it is a group performance, each dancer wears a different makeup as per the role or character. The dancer playing a noble hero or god wears green makeup on the face, while the dance playing a demon smears his face in green with red marks on the cheeks. It has become a popular dance drama over the years. Chenda, Cymbals, and Maddalam are the instruments used in Kathakali shows. Kuchipudi has risen to international fame from a village in the South Indian state of Andhra Pradesh. This classical dance of India owes its origin to the Telugu Brahmins in Kuchelapuram Village, who were known for their expertise in staging the mythological legends through dance, drama and music. Kuchipudi has evolved from the Bhagavatmela tradition and differed from other Indian classical dance forms by the use of speech. The Kuchipudi dance moves are faster than those of any other classical dance. It is performed to both the Carnatic music and the Hindustani Music. There are a few variations of Kuchipudi. 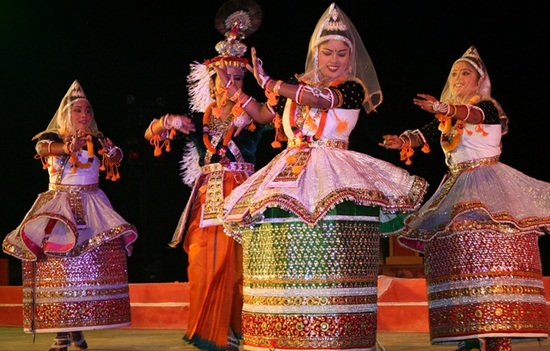 Manipuri, a distinguished classical dance heritage of northeast India, deserves a mention here. Woven into the life and culture of Manipur, a northeastern state amidst hills, Manipuri is known for its poetic charm, colorful costumes and delicate moves. Since the time when the gods, as it is believed, dried a lake in the countryside of Manipur to make space for dance, this classical dance has been part of the socio-religious culture of the state. Ras Leela and Sankirtana are the devotional themes of Manipuri dance. The Manipuri dancers wear colorfully embroidered skirts with transparent embellished veil. One of the classical dance forms of ancient India, Odissi is the cultural pride of the state Orissa or Odisha. Like other forms of Indian culture, Odissi has its own story of survival. It has evolved through modifications over years. Nritya and Abhinaya are two most interesting highlights of Odissi. In Nritya, the dancers make delicate body movements to create ornamental moves. In Abhinaya, the dancers make myriad facial expressions to interpret a religious story or mythical legend. Odissi is performed in a multiple different styles including tribhangi. Indian Eagle shares with NRIs their love and respect for the culture of India. That is why IndianEagle.com offers the cheapest air tickets to them. The picture in desciption of Bharatanatyam is Odissi..
By reading this article, i have come to know the deeper aspects of indian dances.